If you've been wanting to build your own wearable with an E-ink screen then I have some good news for you. Atmel and Pervasive Displays have just released a new development kit which combines 3 small E-ink screens with a controller board, priced at a low low price of $65. What with the decline of the ebook reader market over the past couple years, E-ink has been putting more and more effort into developing new markets for their screen tech. There are now at least a half-dozen different kits for the DIY market which include an E-ink screen, and E-ink has also released encouraged new products in a wide variety of markets including shelf labels, smartphone cases, luggage tags, smartwatches, and more. And now there's a new one. 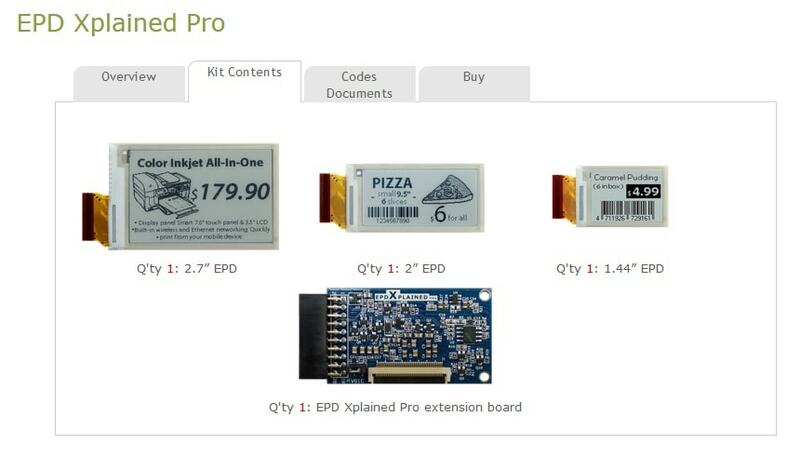 The EPD Xplained Pro kit includes 1.44", 2", and 2.7" E-ink screens from Pervasive Displays along with an extension board which is designed to work with the Atmel Studio IDE. This particular kit can't do anything on its own, but from what I have read online and in the user manual I can tell that this kit is designed to work with other Atmel Xplained Pro development boards like the SAM4L Xplained Pro and the SAM D20 Xplained Pro. E-Paper displays (EPD's) are being utilized for reusable transport items, medical display devices, electronic security badges, smart tags, labels, and just about anywhere paper is being used for conveying important information in industrial and commercial applications. In addition, e-Paper is being used to display retail and commercial product pricing and information, diagnostic charts, barcode and QR codes and work instructions for assembly lines and manufacturing. E-paper provides an advantage over traditional paper displays by reducing expenses for paper materials and labor. E-paper also provides paper-like readability, high resolution, high contrast, 180 degree viewing angle, and is an ideal TN/STN upgrade. Too bad that these displays sport only 1 bit colour depth, i. e., no gray scales.